The previous day I took a photo, through the gloomy downpour, from the middle of Scarborough Bridge. 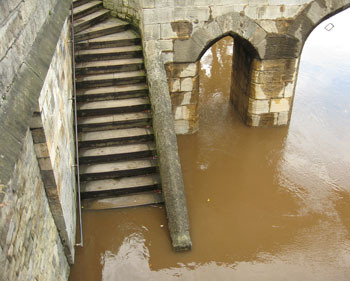 No chance of getting up there to take a comparison photo – the water has reached the steps and the floodgates to the approach are firmly closed. Though a small amount of water was seeping through, rather worryingly. 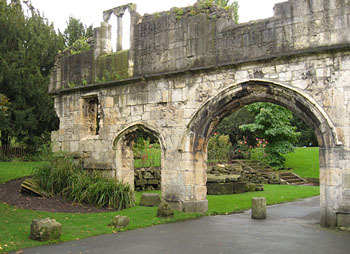 This ruined bit of building attached to the hospitium in the Museum Gardens is known as the water gate, appropriately. Back in the days when the nearby abbey was a functioning institution, rather than a(nother) ruin as it is now, this led to the river. 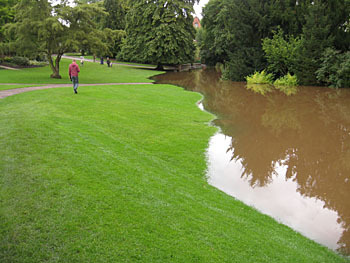 The river is still close by, but now there’s a small flood bank built between the water gate and the river’s edge, in this part of the gardens. But the banked section is only short, and doesn’t protect the rest of the Gardens from the river. Not normally a problem, but it is this time. The river has flooded the lower sections. Overturned benches stuck out of the floodwater. It will of course leave a heck of a mess behind when the river levels drop back to normal. Lendal Bridge took us safely across the river, where Barker Tower on the riverbank was sitting in water, as it so often is. The riverside road alongside it that these steps lead down to was also under a fair bit of water. Lots of mud to clean away here too when the river levels drop. 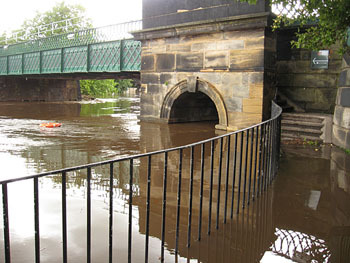 Though the riverside paths upstream are impassable, the riverside road on the other side of Lendal Bridge was open as normal, because of the flood defences built here. A wall with strong metal gates holds in the river when it rises. My companion reminded me that in the floods of 2000 this flood wall had sandbags on top of it, and that the water was near the top. So not quite as high, though the river hadn’t peaked at the time these photos were taken, in the late afternoon. More photos from here on the earlier page: Ouse levels, September 2012 floods. The river may be held back on North Street, but that big old Ouse oozes out again as soon as it gets chance, over Queen’s Staith, up onto Skeldergate. Opposite, on King’s Staith, the King’s Arms pub and other businesses who deal with this mucky mess on a fairly regular basis. Striking to see buildings not normally reflected in water, here on Skeldergate. Another point to stress, which isn’t always clear when the floods are reported in some of the more sensationalised TV and newspaper reports, is that a lot of the flood water isn’t that deep. 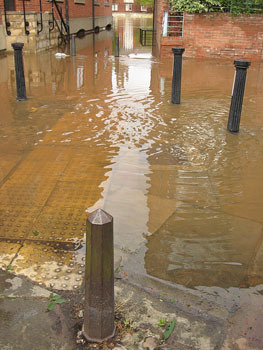 Here, at the bottom of Carr’s Lane, the alley leading down from Bishophill to Skeldergate, paving is visible through shallow water. Still didn’t fancy wading through it though, so we headed back up to dry ground. Ah, the dear old Bonding Warehouse. So clearly deserted and standing vulnerable to the floods, and photographed so often with flood waters around it that this image, taken from Skeldergate Bridge, is rather a cliché. If I remember rightly it was the last severe flood of 2000 that led to its closure. 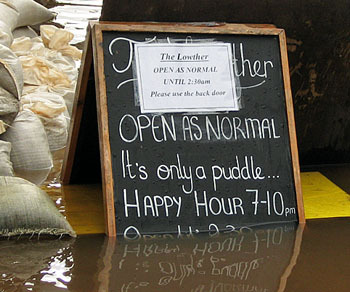 Over on the other side of the river, an optimistic sign outside the Lowther pub, with the words ‘It’s only a puddle’ looking like they’re soon going underwater. These roads down from Clifford Street to the river often flood at their lower end, but not usually this much. 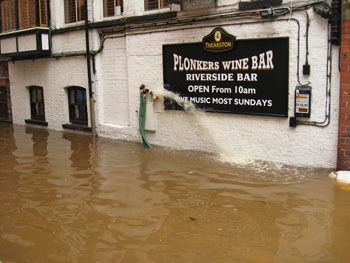 A pipe from the side of Plonkers wine bar kept discharging spurts of water presumably extracted from the cellars or ground floor areas. A hand appeared from a nearby window and emptied a bucket of water back onto the street. Business owners stood on doorsteps and passers-by like me took photos, and we all stood around staring at the water. At the top of the road a TV reporter prepared to wade in to the floods. Reporters from other TV companies had previously been spotted standing around in waders over on Skeldergate. 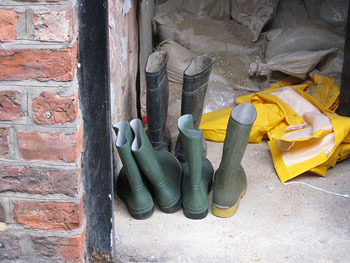 Heading back up the road, a glimpse of what they store behind the doors on this street – wellies, waterproofs and sandbags. Without wishing to be unsympathetic to anyone having to deal with flood damage and the like, York has been flooding since the Romans were here, in fact the Roman bridge was swept away in 630ish [ that’s 630AD, not just after The 6 O’Clock News ;-) ] in a, by the sketchy accounts that have survived, catastrophic flood.. It is really grim for those directly affected, and of course many of those are outside of York in places down river. Heard a woman from Acaster Selby on BBC Radio York yesterday sounding very distressed at the flood situation there – she had livestock to manage as well as flood damage to her house which had meant her children had to go to stay with relatives. Sounds awful for her and others affected. Is interesting to see though, particularly on Twitter, how @VisitYork and others are struggling to get across the message that most of York is unaffected. Places like the Merchant Adventurers Hall are getting a lot of enquiries from people who seem to think most of York is underwater. 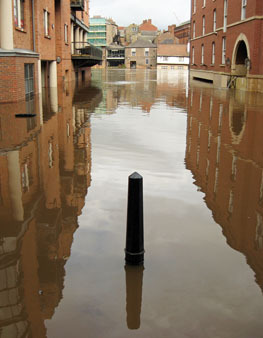 Whereas of course flooding is localised and most of York is as normal. Hope the problem can be put into perspective. 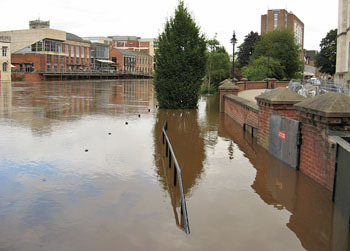 I was born in York in 1928 and the river has I think without fail flooded some part of York each year. There has been talk about using areas as flood plains but I think the sheer volume of water would probably render that a waste of time. 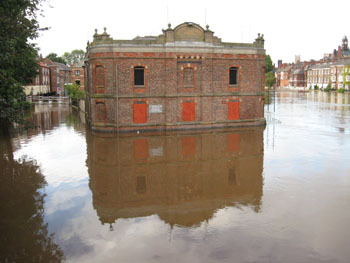 Perhaps in the future there might some way of diverting water well above York, a new Lake district!!! it will ever be a problem and it will take someone very inventive to come up with a possible solution. 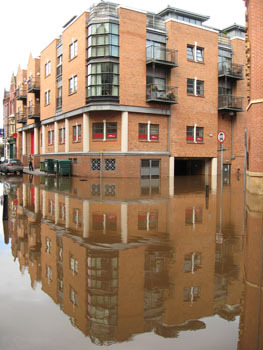 there should certainly be no more building on the areas that flood each year. skeldergate and North St have always been problems. Perhaps in the future there might be some solution in the areas above York where the rivers begin. Im sure that some remedial action will be found to ease the flooding. Meantime long suffering residents of the areas that flood most years will just have to go through their annual misery and I would imagine find their houses unsaleable.